If you’re planning a balmy beach break this summer and want to know where the best holiday destinations in July are, look no further. We’ve shortlisted the sunniest places to visit whether you fancy a short haul retreat by the sea or a luxurious long haul escape somewhere more exotic this 2018 – all you have to do is pick your favourite, and pack! If you want a fantastic family holiday you won’t forget, Florida should be the first destination on your list. You’ve got the gorgeous Gulf Coast that’s sure to fulfill all of your beach holiday dreams, a spectacular natural landscape framed by National Parks and a whole host of entertainment from city-sized malls in Fort Myers to unbeatable restaurants and bars in Miami. But the major draw of this Sunshine State is undoubtedly it’s world-class attractions, with Disney World, Universal Studios, Busch Gardens and The Wizarding World Of Harry Potter all on offer in Orlando – parents and kids alike are sure to feel the magic in this all-round resort. Plan your itinerary now with the help of our exciting things to do in Florida guide. If dazzling white sands, historic monuments, fantastic cuisine and buzzing beach parties along the Caribbean Coast sounds appealing, then Mexico’s most popular resort is where you should head this July. The Hotel Zone is where all of the action happens, its beachfront location making it a fantastic base for exploring both the shore, and more. Cancun’s old town is rich in culture and the toasty temperatures make it great for exploring, tick off iconic archeological sites including Chichen Itza, or discover an underwater paradise in Isla Mujeres. 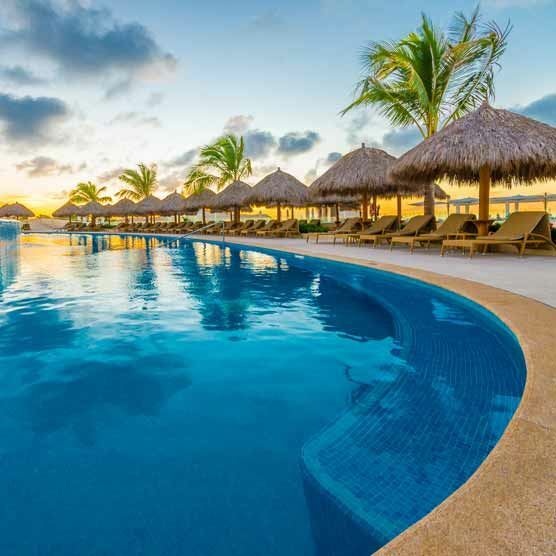 Playa del Carmen and Riviera Maya are popular resorts in Cancun suitable for friends, families and couples. Greece has so many gorgeous destinations waiting to be discovered, it’s difficult to know where to begin. The Aegean Islands are a hot spot (in more ways than one) thanks to their breathtaking beaches, candy-coloured towns, authentic fishing villages and stunning sea vistas. Santorini is a beautiful spot for romantic couples holidays and is famous for idyllic cliff top towns, blue-domed buildings and spectacular sunsets, while holidays to Rhodes are fantastic for families with a handful of all-round resorts, great beaches and nearby attractions. If you’re feeling adventurous, explore lesser-known isles including beautiful Lesbos and Thasos – one of the greenest destinations in Greece. What's cool about the Costas? The Spanish Costas are a summer holiday favourite, with some of the best beaches, towns and entertainment around - plus a wide variety of resorts fit for every type of traveller. Costa Brava on the northeast coast oozes tradition, with hidden villages, sandy coves and quaint fishing communities waiting to be discovered. Costa del Sol is supercharged with high-end resorts such as Marbella, Malaga and Torremolinos, so you’re sure to have a full itinerary, or why not enjoy a lazy holiday on the white coast of Costa Blanca, where Blue Flag beaches, buzzing bars and tasty seafront tavernas await? If spectacular golden beaches, stylish cities, Mediterranean climates and vibrant resorts sounds like your ideal summer holiday all jumbled into one, then Portugal is the perfect place for you. The Algarve is the best destination for beaches, where rugged orange cliffs and whitewashed towns frame the powder soft sands and wave-ready waters are abuzz with surfers in the light of sunset. Albufeira and Vilamoura are popular resorts for families, with an abundance of attractions including waterparks, restaurants and parks nearby. For city breaks, Lisbon and Porto are packed with amazing sights, shopping and food spots. This tropical island escape is bursting with natural beauty, dramatic landscapes, ancient culture and picture-perfect sands, with upmarket beach resorts and boutique hideaways just waiting to be discovered. The long haul flight is worth every second once you begin to explore this Indonesian delight, where the lush rice terraces, colourful vineyards and tranquil spa retreats of Ubud rub shoulders with the lively, atmospheric towns and exclusive beach resorts of Nusa Dua, Legion & Seminyak - Bali holidays are complete paradise. This paradise island is your go-to destination for champagne sands, crystal-clear seas and sensational cuisine – not forgetting its tropical temperatures too, of course. Barbados holidays tick all of our boxes; it has 92km of long blonde beaches to bask on, (with the resorts of St James and St Peter earning their nickname as the Platinum Coast), a thriving nightlife scene in St Lawrence’s Gap and the quirky capital of Bridgetown - full of culture, cricket and the sound of calypso music sweeping the cobbled streets. You’re sure to experience ultimate R&R in this Caribbean gem, so save us a glass of rum!